Pflueger Supreme XT is the Best Spinning Reel for Trout as per our reviews. Pflueger Supreme XT is a lightweight, smooth, and strong reel. The high-speed gear ratio and smooth drag system make it a great choice for anyone who enjoys catching a variety of fish. People notice the Pflueger Supreme when I take it to the lake. It has a stylish black design with orange accents. Those orange accents are perfectly placed to make the reel stand out. The overall design is similar to others, but you begin to notice features and details when you take a good look at it. With a high-speed gear ratio of 6.2 revolutions per spin, the Pflueger Supreme XT is perfect for a variety of situations. When you need to let line out quickly, it can do that, but it also works for medium crankbait fishing where you need to go a little slower. It is the best choice for bass anglers because you can use it for different times in the season. It can retrieve about 31.8 inches per crank, so you can quickly pull in when you have a fish pulling on your line. Just remember that the size of the spool you are using can affect the retrieve rate. The Pflueger Supreme XT is fast and controlled, so the person holding the reel can decide how to use its features for different situations. All Pflueger products come with a one-year warranty, including the Pflueger Supreme XT. In most cases, you will have to ship it to the manufacturer and complete some paperwork. They will repair it or send you a new one immediately. Be aware that some things might void the warranty, like misusing the product, or taking the reel apart. The Pflueger company really knows how to stand behind their products. Their customer service is easy to work with and available by phone or through a form on their website. They respond quickly, and you can get ahold of them at almost any time of the day! KastKing Sharky III series fishing reels are designed for the next-level performance. These reels are made of special water and dust resistant material for protection under any circumstances. Sharky III series reels come with a lot of innovative features and cutting-edge technologies. The Sharky III 2000 is a powerful yet versatile reel. It combines several features into a powerhouse that weighs only 9.2 oz. It has a gear ratio of 5.2:1 and a max drag of 33 lbs. These powerful specs make for a high-performance reel. You will also be impressed by the intrinsic and intuitive design of this reel. The body uses reinforced graphite to give you ultimate support while fishing. Sharky III uses high-quality stainless-steel parts throughout its entire design. The drag system uses a triple disc design composed of heavy duty carbon for additional stability. The reel has a 27.5 IPT and a 70 CPT to make Sharky III a reliable reel even under rigorous circumstances. KastKing Sharky III 2000 comes with 10+1 ball bearings and 70 cm per turn. Sharky III 2000 has a standard line capacity of 25/150 lb/ yds., which is great if you plan to catch medium to large fish. All this on top of an 18 Kg drag capacity is purely insane. Double shielded stainless-steel ball bearings. Long lasting and durable aluminum handle. The Sharky III 2000 comes with a 1-year manufacturer warranty that covers manufacturer defects. The warranty becomes void if there are any modifications or damages to the reel. The warranty only covers defects from the manufacturer. Regular wear & tear are not covered by this warranty policy. The Penn Battle II is a high-performance spinning reel ideal for catching large trout. Unlike other fishing reels in its class, it comes with a lot of high-performance features that make it stand out. 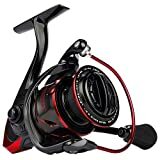 This is the second generation of Battle and Penn has really outdone itself when it comes to the features and the high-quality materials used for this spinning reel. This reel is suitable for both left-handed and right-handed anglers as you can switch the handle to meet your needs. The Penn Battle II features a patented HT-100 carbon fiber drag system that provides the powerful drag you need for large fishes without giving up on smoothness. The drag washers are treated with grease to ensure the life of your spinning reel. The gearing is all smoother than the last generation and just moves so fluidly that you can really feel the quality materials. The bail trips over smoothly and you have up to 25 lbs. of drag at max and that is just tremendous. Penn Battle II features a rubber gasket so that you can use a braided line all by itself instead of using monofilament line. You can hold about 300 yards of braid line. If you search the market for the best trout spinning reels, you will find the Penn Battle II at the top of the list. KastKing Centron 5000 is a high-quality reel that comes with a two-color anodized aluminum spool. The spool comes with plenty of line lay, internal grooves for lube retention, and more line capacity. The reel itself has a brilliant finish and is lightweight and compact. The frame resists corrosion and the handle is right/left hand interchangeable. The reel includes 9 smooth ball bearings and one instant stop one-way anti-reverse bearing, all of extremely high quality. The reel ships quickly in a padded carton for extra security and protection. KastKing Centron 5000 performs extremely well in both fresh and saltwater conditions. The reel is compatible with braided line and works best with the KastKing brand line. The various models of the reel can be used for an array of different kinds of fishing including bass and catfishing. With this reel, you never experience snap back due to the bail snapping closed on hard casts. The reel is quiet and makes for smooth casting and reeling, never wobbles, and has an expensive feel. KastKing Centron 5000 spinning reel is built to last and can withstand a variety of conditions. The anodized aluminum body is corrosion resistant and will hold up in even the most taxing conditions. Additionally, the reel is made to be easy to maintain and does not require excessive upkeep. If you forget to rinse off, re-lube, or grease your reel from time to time, it will still perform as well as it did out of the box. 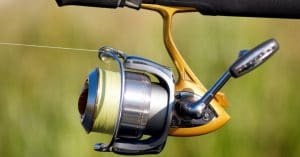 The reel is designed to be used in either fresh or saltwater conditions and will not show signs of wear or corrosion even after many uses like some other reels. KastKing Baitfeeder III is a great spinning fishing reel. It has a baitfeeder system, which means it allows you to control both the rear and the front drags. It has a wonderfully large bail wire and a line roller with a bearing to allow spinning. It comes with a 5.5:1 gear ratio and 10+1 ball bearings. KastKing Baitfeeder III comes in a sleek black box, with graphics and product information on the front. When you open the box, you will see your reel packed inside with cellophane. It isn’t totally put together. You must place the handle on the reel before use. You will also find a spare high strength graphite spool inside the box. There are many features that are unique to the KastKing Baitfeeder III that aren’t seen on other reels. 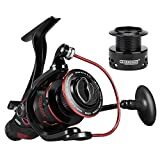 KastKing brand is known for its performance as well as the amazing build quality that go into making this top-rated spinning fishing reel. The KastKing Sharky Baitfeeder III is a lightweight yet powerful reel. 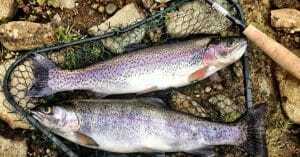 It allows the anglers to reel in large fish with the ease and simplicity of reeling in a smaller fish. The ability to switch between the front and rear drags can be helpful when you least expect it. It gives you confidence in the equipment you are using. With the powerful drag and precision gears, you won’t find a better baitfeeder. KastKing Baitfeeder III is set up to be a great reel for both salt and freshwater fishing. KastKing Summer 3000 is packed and loaded with tons of excellent features that make it easy for you to catch all the fish you can. It has a max line capacity of 8-10 lb. and 270-330 yds. 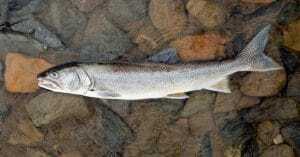 This is likely to be enough for you to catch medium-sized fish without worrying about your line breaking or loosening. KastKing Summer 3000 uses a lightweight graphite frame which makes the reel very easy to hold, handle, and carry. The spool on the Summer 3000 is composed of a two-tone anodized aluminum. Also, the spool comes with a very powerful launch lip which allows you to cast very long lines. The Summer 3000 has a very high capacity which allows you to hold large amounts of the line without having to constantly re-spool the reel. The high strength tension graphite frame is resistant to corrosion which ensures that your reel lasts for a long time. The drag system on the Summer 3000 is very powerful which gives you high accuracy and control over your fishing. The handle on the Summer 3000 is interchangeable so you can use it with both your right & left hand. The pinion system on the KastKing Summer 3000 is very precise to ensure that all your catches stay hooked. KastKing Summer 3000 comes with an alloy drive gear that is very durable so you can wind up hard when you catch a fish that is giving up a fight. Summer 3000 weighs 9.9 Oz and comes with a maximum drag capacity of 13.0LBs. KastKing Centron 2000 is a high-powered spinning reel. It has a maximum drag of 13 pounds or 6 kilograms. Its superior drag offers incredible stopping power which goes up to 20 pounds. It has a hardened metal main shaft, impeccable mesh dive and a precision machined pinion gear. KastKing Centron 2000 is strong enough to reel in big fishes. You can easily catch some big fishes without having to worry about the reel breaking off. You can catch small bluegill to a 30-inch trout and can be least bothered about any damage that the reel may incur. The reel looks excellent and stylish. It comes with a brilliant finish and has high strength, colored, anodized aluminum spool, with a power launch lip for further casting. 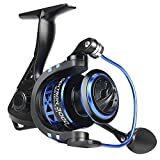 KastKing Centron 2000 holds more line than even many other more expensive fishing reels. This reel is highly durable and dependable. It can be used anywhere, be it freshwater or saltwater. Its brilliant finish and usage of the quality materials resist corrosion even when it is exposed to different water types and conditions. This reel can be effectively used in most casual fishing environments. 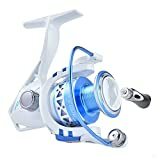 So if you want to go fishing out in the sea, or are planning to catch some massive freshwater fish, this reel is the perfect tool to be used in your expedition. KastKing Centron spinning reel not only provides high-quality performance, but it also comes with great customer service. This fishing reel is very durable and a long lasting one. But KastKing can help you easily service it in case of any damage. Also, customers can rest easy knowing that this reel comes with a solid warranty. When building your tackle, a spinning reel can really make the difference whether you would have a successful fishing trip or not. A spinning reel is especially useful for bringing in larger fish or other fish that are tough to reel in. 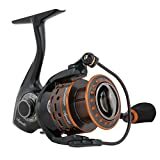 When choosing a good spinning reel, you want to consider body composition, gear ratio, number of ball bearings, size and reliability. You must be prepared with the right accessories to make sure you have the best fishing experience. We hope you like our pick of the Best Spinning Reel for Trout Fishing. 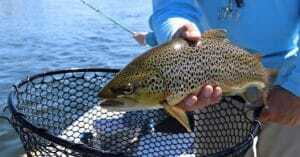 If you would like to recommend any other fishing reels for trout then let us know. We will try to include it in our next update.